THE SLAP, A Review of a Short-Lived TV Series? It stars Zachary Quinto as Harry, (the slapper), Dylan Schombing (the slapee), Melissa George (the slapee’s mother), Uma Thurman, Penn Badgley, Peter Sarsgaard, Blythe Danner, Thandie Newton, Makenzie Leigh, Brian Cox, Thomas Sadoski (Slapee’s father) and Victor Garber just to name a few. The show opens introducing us to a mildly spineless father and husband, Hector (Sarsgaard), his “strong willed” wife (Newton), and their little family dynamic, including that 18 year old girlfriend that dad has on the side. We then slide up into a barbecue birthday party for Hector, where all the family and friends are invited.. including his illicit little girl-toy (What?). The scene is set as we meet everyone coming in to the party and it’s clear what the messages are. Harry (Quinto) seems to have that edge of anger-at-life mode, he already hates Hugo’s (slapee) father, Gary (Sadoski), and it is clear cut that Hugo has been brought up in a sort of hands-off fashion… unless you count when mom Rosie (George) breast feeds him when the five-year-old gets in trouble or yelled at. And this kid is a hellion. He destroys a vinyl record collection, tosses expensive electronics at a whim, shreds the flower garden to keep himself entertained. When playing with friends he believes he deserve six outs, not three, when he can’t hit a toy ball with a wooden bat that somehow manages to find it’s way into the little demon’s hands. Meanwhile all the adults are engaged in either hand-holding with their 18-year-old girlfriend, arguing that Hector needs to control his wife (Old school grandparents) or what not. So pretty much everyone is ignoring the debacle that is taking place. That is, until the kids tell Hugo he’s out, but he refuses to let anyone else take a turn at bat and starts swinging the deadly little piece of wood at the other kids. Now never mind that the parents are non-combatants so to speak and are only watching this unfold, but then the angry guy, Harry, goes flying down the patio steps and snatches the bat out of Hugo’s destructive little hands. Hugo then hauls off and kicks Harry in the shin, and Harry hauls off and slaps the kid into tomorrow. (Harry 1, Hugo 0) Well, if you saw how Hugo’s mother reacted, you’d think Harry knocked Hugo over the fence for a home run or something. TO CLARIFY, it is wrong to hit someone else’s kid and in some cases, even your own. I like tasers myself. (OK, just fooling.) But wow, did this kid have it coming. And you can see he’s nothing but a byproduct of the parenting style he’s been subjected to. in fact after he got slapped around, I was half-expecting his mother to pick him up and breast feed him again!!! Add to the intensity the fact that Hugo’s father already intensely dislikes Harry. and to be honest, if left to his own devices, I think Harry would have figured out a way to manage to slap most everyone else at the party. After ‘The Slap,’ the party breaks up and everyone goes their separate ways (They don’t want to get slapped either! ), though we learn that later that evening how slapee’s father is going to sue the slapper. Basically, The Slap takes the peaceful, real-world scenario of Parenthood and injects some serious character extremes into the picture. But wait… and my favorite part (that was totally sarcastic) is the intermittent voice-over that makes me cry out-loud “What The Flip?? ?” (replace flip with, well, whatever you are comfortable with.) and laugh at the same time. This voice-over is not a consistent presence, but rather, an intermittent moment when this disembodied voice describes to us how Hector is feeling about something. I mean, WTF? Seriously? It’s books on tape, but without the tape. “And Hector pulls up to the light, thinking if it stays green, he’ll go home. If it turns red, he’ll go to the office.” NO, SERIOUSLY, that was a paraphrased quote from one of the voice-over moments. I’ve heard the book was good (Thanks to a mini-review from my sister-in-law, Jen!) and I’m wondering if the mini-series will either improve with the potential we have here, or continue to extol the various characteristics to their extremes throughout the eight-episode mini-series. Looking at the cast listing, it claims that “narrator” is only in one episode. Great, we’ll never know what Hector is thinking now. (But that episode count was incorrect.) But I see court officers, detective roles, prosecutor roles, and all kinds of fun roles. On the other hand, Quinto and George are pouring it on and making it easy to dislike their character flaws, which has me appreciating their talents. I’ve never quite seen Quinto like this. After the fact: I watched the season and each episode focused on a different set of characters and their involvement with this incident that became a legal action that tore apart the family. It was interesting and yet slow and sometimes curious. The talent was mostly under-utilized but their presence still brought this show up a notch higher than if they hired no-name inexpensive talent. 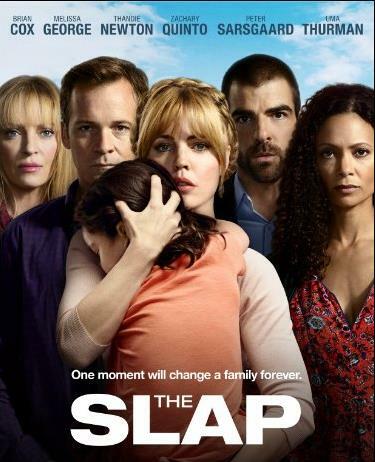 Depending on what you like for your television entertainment The Slap could knock your socks off without laying a finger on you!